Just seen this reply, so apologies for the gap in contact. If the trade is emitted the spreadsheet has not picked it i[ the last trade was in early April. did you sheet still work? If so i will re install the sheet and see if that fixes it. I've never had a version of gekko where the trade isn't emitted... Although currently it seems to be emitted twice each trade and I haven't looked into that yet. If yours isn't getting anything in the form responses tab it isn't a problem with my sheets code - it only kicks in once a response is recorded. It's either gekko not emitting trade, an issue with the gforms config in gekko, or the form being no longer linked to the sheet. I have this same problem like others. Email notifications plugin from gekko works fine, but Your spreadsheet not. I did yesterday fresh install, check all 3 times and nothing, zero response. 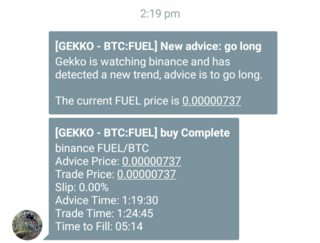 Gekko dont print performance analyzer stats on complete trade. Maybe can help in our problems? xFFFFF - you have more coding experience than I if you test this can you let me know if it works and i will implement it,. You can download and replace files in Your gekko. Weird that mine works... You seem to be getting the trade event twice like me though? > Exposure time of trade. I pulled the latest gekko and it's no longer emitting the trade event for my. xFFFFF's fix above doesn't appear to have worked either. This makes it quite difficult to properly test the new plugin - it works with paper trading, but as ever if there are bugs let me know/raise an issue on github etc. Thank you for the update, i would use pushbullet but cannot get the API to load on my VPS to register, i will try it again with you updated plugin.